Last month, I kind of, sort of started getting into the flow of cooking everyday. And of course, just as I was warming up, I left for Kerala. I’m back at my place in Bangalore now, and have nothing but a box of halva and some hot sauce staring back at me when I open the fridge. I think milk for coffee and eggs and yogurt for Turkish eggs are a good place to start, no? One of things that helped me cook more is having people over for dinner. One night, I made a prawn biryani, with raita and coconut chamandi. Another time, much to my dinner guest’s horror, I made a 4 course meal which was…vegetarian. Both times, for dessert, I made a custard apple payasam. In fact, I made the payasam four times in the span of two weeks. 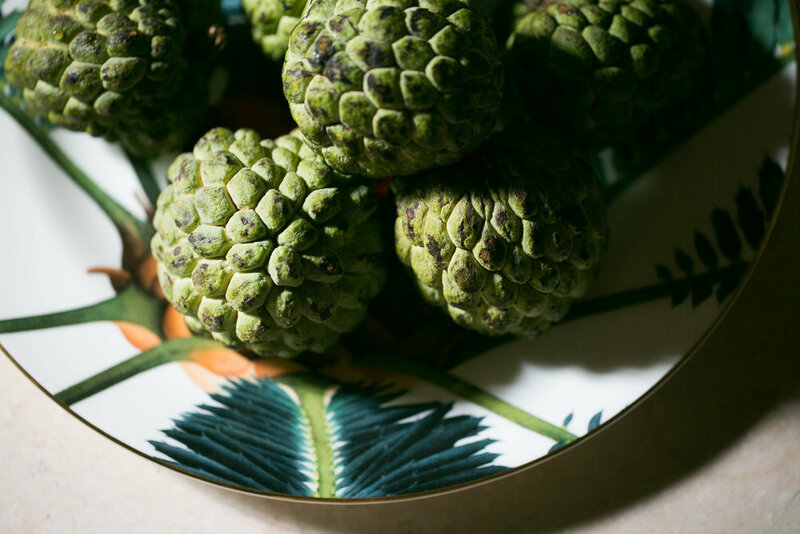 My fruit person has the best custard apples in town, impossibly sweet and custardy. For the entirety of those two weeks, I had a stash of custard apples with me at all times, and I’d fallen into a pattern of checking on them every morning to see if they were ready to be turned into payasam. Sometimes I’d get impatient and put them in brown paper bags, but mostly, I liked the anticipation. I make the payasam in the morning because there’s really nothing better that adding a spoonful or two of the thickened milk to your morning coffee. It’s the second most compelling reason to try this recipe (the first being that it’s so darn delicious). The key is to find full-fat milk that is not toned/pasteurised. I use the orange packet of Nandini, here in Bangalore. Mum uses the green packet of Milma in Kannur. 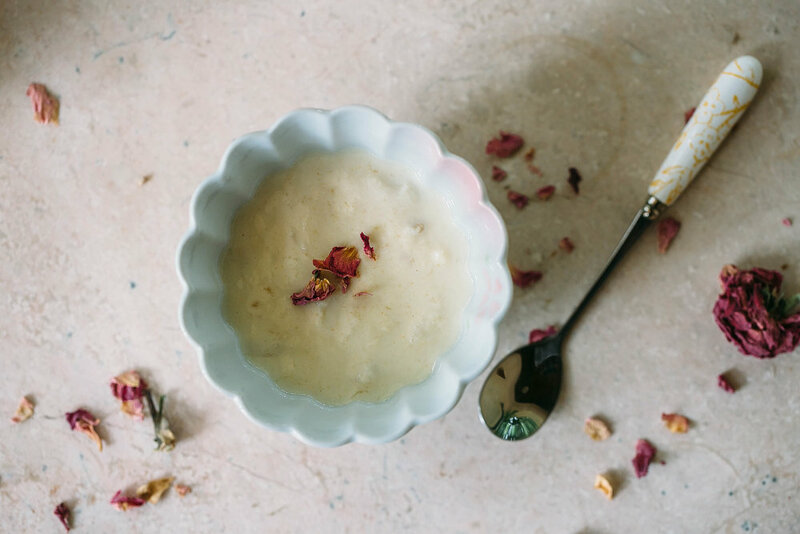 The payasam is every non-payasam-lover’s dream: more like a cozy version of Natural’s custard apple ice cream than an actual payasam, it isn’t overtly sweet or rich, and is light and floral thanks to the rose water. I’m on the lookout for some fun Indian podcasts to listen to. If you know of any, please let me know! NOTE: While prepping the fruit, don’t scrape the flesh too close to the skin — it tends to be grainy and changes the texture of the payasam. In a heavy-bottomed pot, bring the milk to a boil. Reduce the heat, and let it simmer on medium, stirring every now and then to prevent it from catching at the bottom of the pan and to dissolve the milk solids that form. Continue until the milk has reduced to about 3 cups. This should take approximately 45 minutes. Add the sugar, and stir to dissolve. When the milk has cooled down, add the rose water and gently stir in the custard apple. Refrigerate and serve with dried rose petals, if using.